Our boats over the Plemmirio Roman wreck, looking south along the shore of eastern Sicily towards Africa. I’ve just finished reading Bryan Ward-Perkins’ excellent The Fall of Rome (Oxford University Press, 2006) in which he uses archaeological evidence to argue – very persuasively, in my view – that the end of the western Roman empire in the 5th century AD was not a period of ‘transition’ but rather one of devastation and economic collapse, in terms that Edward Gibbon would have understood almost three centuries ago when he wrote The Decline and Fall of the Roman Empire. Gibbon, of course, had no archaeological data at his disposal, but the number of excavations and syntheses now published has allowed historians such as Ward-Perkins to use the evidence with confidence, seeing patterns for example in pottery distribution that can be related to wider questions about the ancient economy as a whole. The fact that many ancient historians have now worked on archaeological sites means that they have a clearer grasp of the possibilities and limitations of the evidence than their predecessors, something that has helped to merge the disciplines and allow a unitary approach to the big questions of ancient history – questions that are still there to be tackled, as Ward-Perkins demonstrates with great verve in his book. A photo of me with other expedition divers more than 50 metres deep below the Roman wreck at Plemmirio, with a heavily encrusted Byzantine amphora. Divers will spot my beloved Poseidon regulator - bought with the proceeds of a summer working on a farm when I was 16, and still used by me today (you can see it in the ice-dive and night-dive videos on the website homepage). One of the more fascinating contributions of archaeology to this debate has been to reveal the extent of literacy in the Roman world, and its apparent decline following the Germanic invasions of the 5th century AD. Ward-Perkins cites the best-known evidence that literacy at the height of empire, at least at a basic level, was not just the preserve of the aristocracy: the graffiti found on the walls of Pompeii, including the famous brothel inscriptions (‘Sabinus hic,’ ‘Sabinus was here’); the soldiers’ letters found in the waterlogged site of Vindolanda on Hadrian’s Wall; and the thousands of scraps of papyrus preserved in the Faiyum and elsewhere in Egypt. Most obviously related to his thesis – because they too disappear almost entirely in the west after the 5th century – are inscriptions concerned with the production and distribution of goods, especially inscribed potsherds at kiln sites and stamped and painted inscriptions on amphorae, the storage vessels produced in their millions to transport wine, olive oil, fish-sauce and other products around the Roman world during its economic heyday. Africano Grande amphoras from the wreck, including the neck stamped PP at upper left (drawing: David Gibbins). 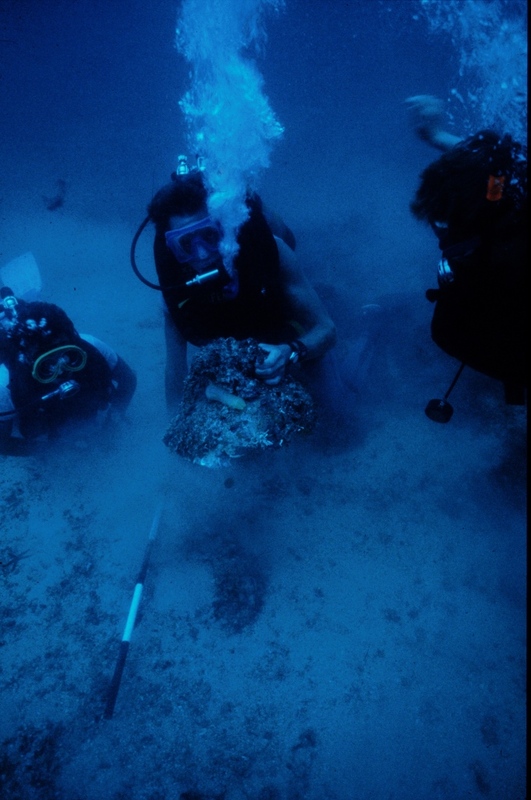 Jenny Lobell with an Africano Grande amphora from the wreck. I’d like to add a small but poignant example in support of this thesis from a Roman shipwreck excavated under my direction off Sicily. Wreck finds can be particularly meaningful because they usually represent accidental loss of material in use rather than rubbish, and this can give extra significance to any inscriptions found. The Plemmirio ship, dating from about AD 200, carried a small cargo of cylindrical ‘Africano grande’ and ‘Africano piccolo’ amphorae, the former probably filled with fish sauce and the latter olive oil. She was wrecked at a time when Rome’s main source of olive oil – part of the emperors’ handout to the people – was shifting from southern Spain to north Africa, at the time of the African emperor Septimius Severus. I’ve put the title of my novel The Last Gospel in the blog heading because the Plemmirio wreck was the inspiration for the shipwreck of St Paul in that story; diving down the cliff base deep below the Severan wreck, Jack and Costas discover another, fictional wreck, of the 1st century AD, including an amphora with an inscription that clinches the ship’s identity and allows them to set their sights on Paul’s ultimate destination, the city of Rome itself. A sherd from the shoulder of an Afriocano Grande amphora with the remains of an inscription - perhaps in pitch - that may read EGTTERE, probably meaning 'to go.' Inscription approx. 16 cm across. In our deep-water explorations beyond the Plemmirio wreck we did indeed find evidence of other wrecks, ranging in date from Archaic Greek to Byzantine, and on the Plemmirio wreck we made the discovery that inspired the fiction - one of the Africano grande amphoras with a painted inscription probably reading EGTTERE, an infinitive almost certainly meaning ‘to go.’ Unlike the minutely detailed inscriptions found on Spanish oil amphoras of the 2nd century, designed to be read and deciphered only by administrative officials, this was a big, bold inscription on the shoulder of an amphora, meant to be seen from a distance and instantly understood by those hurrying around a harbour front. I’ve little doubt that it marked a batch of amphorae corralled together and destined for export. To me, there could be no better example of the use and extent of literacy in the ancient world – the dockworkers at the lower end of the socio-economic scale who saw this might only have needed to read a smattering of words to carry out their jobs, but if they could read this then the chances are that more of them were more generally literate than we might have supposed. An Africano Grande amphora with the stamp ending PP visible on the neck. A small portion of finds from the Plemmirio Roman wreck, including four pottery oil lamps along the top of the box. That graffito wasn’t the only inscription that we found on the wreck. One of the Africano grande amphoras was stamped on the neck before firing with letters ending PP, probably a Praetorian Prefect responsible for amphora production near the olive estates and fish-salting installations along the African coast. Whether or not the Plemmirio cargo included a state consignment, perhaps of oil, can never be known for certain, but this stamp is vivid evidence of the extent of state involvement in amphora production and the stimulus it provided to commercial trade. A third find was the maker’s stamp IVNDRA on a beautiful pottery oil lamp found among the ship’s galley stores. We think that Iunius Draco was a lampmaker working in Italy, perhaps in Campania – within sight of Vesuvius, a century or so after the eruption when Pompeii and its brothels were but a distant memory. These two stamps, on the amphora and on the lamp, are themselves fascinating evidence in support of Ward-Perkins’ thesis, but for me that painted inscription is the most telling of all – something quickly painted on the amphora perhaps by a foreman on the wharfside, and surely also understood by the sailors who perished with the cargo against the cliffs of Plemmirio south of Syracuse some time around AD 200. Two of the pottery oil lamps from the wreck, the lower one stamped IVNDRA (probably Iunius Draco) (drawing: David Gibbins). For scholarly reports on these finds, see Gibbins 2001 and 1991c in this list.